Send the crash log to us. Remember to use spoiler [!] icon. Woot! Thanks, friend! I've been missing this mod, ain't nothing like it. Ever. Agreed, we've been missing it, so we brought it back to everyone! And I couldn't make the new Apiary model cause my mouse is broken (little bros do that kind of favors for us). Hope I can buy one tomorrow (in this case I will release it by night). I am holding off texturing Deinocheirus for It's About Time until the main dev finishes his 1.8 port. I will however, start the still soon. I have the textures for prickly pears. And they have been sent to the GitHub page for review. 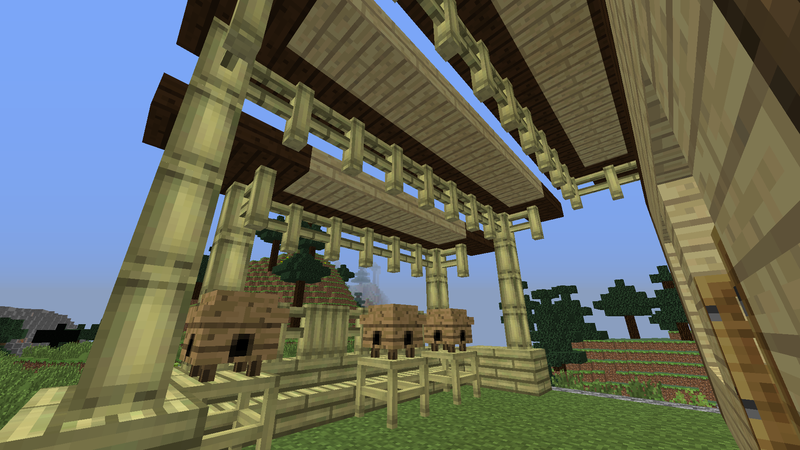 And for the technical problems (bad spawning of village structures) I'll try to fix that soon. I only made two, my mouse's still broken, and I'm doing all of it on touchpad (my fingers are just flesh now), so I need feedback to know if you like/hate the new builds and suggestions for new models or changes on the existent ones. I did experiment with a honeycomb-shaped house about the same size as the little one, if that would be of interest. I couldn't make a small hexagonal house, I have a big preference for the large builds (you should see my world), and I miss the outer space from the original build too. I'll try to do a little decoration for the outside, since it's just a (complex) sketch. I liked the remodelled old too, and the counter is kinda essential to that build. Could you send some screenshots or a schematic of what you've done with the comb-shaped? I can work based on that (and admit, the bee floor looks neat). Yeah I've been looking for it when I started to make the first builds, my first thought was to make it spawn in the forests, a little shack and some bee boxes/hives spread near, but making it on villages is way more viable, so I planned to do something between a shop (for honey) and a beekeping. Have you seen the new model for the old apiary? That's how I want it to look, just a few adjusts and it could be this way. And for the comb-shaped, I'm thinking on a way to make the beekeeping part out of the house (some screenshots shall be released soon). I just got my new mouse when I was writing this, so it'll be realeased sooner than I expected. Hi, I read this thread and wanted to try my hand at building and ended up with a gazeebo or gaBEEzo, luckily the best blocks for gazebos just happen to be from growthcraft! Wow, I really liked what you did there, specially the idea of the gaBEEzo :D, but the only thing I'm not so sure is that we can use bamboo for it. We don't know if everyone will use the bamboo module. Currently we only have a grouped file with all the modules, but we will release a Split-up version further. If the person chose to not using bamboo module, it'll crash the game But I'll ask the guys if we can add some kind of config to choose which version of the apiary to use. For now, do you mind uploading a schematic of it and send me a link to download? If you need some help with it, PM me. BTW, neat profile picture, did you do it all? Here's what I had in mind; a double hexagon gives it a rectangular footprint, which gives room for the bee yard, and also brings to mind "honeycomb" more than the single hexagon (or rather octagon as it was, to be technical :P), at least to me. I tried to incorporate some elements from both of them, if it's not too cluttered. The reason I don't think it should be too big is that it's even bigger than the new farms now (which is fine for those, since they're farms), and may just look a little bit out-of-scale with the rest of the village, dominating it (it possibly has an even bigger footprint than the Witchery keeps, and those are suppose to dominate), and, impressive as it is, I imagine would feel more like a "bee emporium" than just another village shop, since it's so much bigger than the rest. Having a look at the Dropbox gallery again though, the new smaller honeycomb one is looking promising! It looks much more "quaint" and "village bee shop"-like, as I was talking about. I was imagining a more subtle counter though; just some upside-down stairs jutting out into the room perhaps, allowing you or the villagers to actually walk behind them. I hope I'm not giving too much input though, I know I'm not the one actually involved! That looks really impressive though; I'm imagining a huge oriental shrine made with GC bamboo now! why are we reverting back to seperate modules? 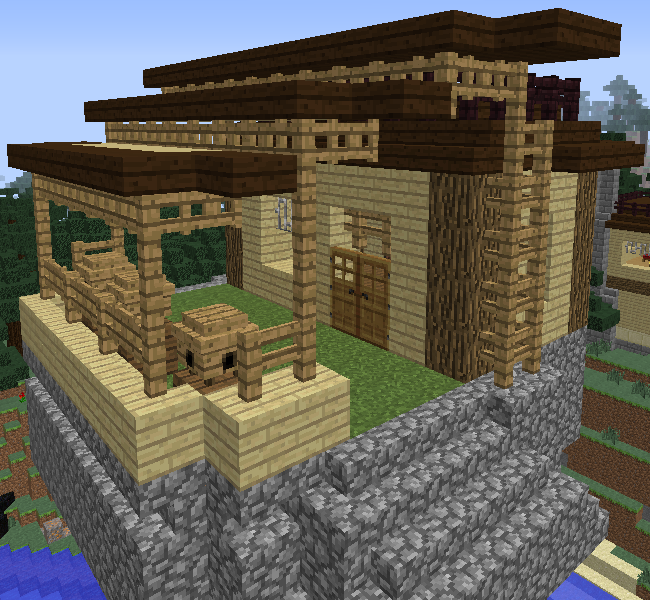 tehFoxx0rz, I like your newest house and especially the detail with the wood, It's all shaping up very nicely and the bee keeper villagers will be very lucky in their accommodations. Right, I'll find my way to open these files. Thanks for your attention. About your builds tehFoxx0rz, I think they got awesome. I should think about making something like that, grouped hexagonal houses (and I noticed that mine were octagonal, just kept quiet to avoid shame :D) I'll try it later. The Bee House, Revision "B"
That's still good, but I heard that stairs have a metadata for every rotation, and it is very complicated to program it all with inverted stairs and everything. I'll see if there's another way to do it keeping the stairs the way they are, I would like to use them mostly for decoration. Another thing, can someone come up with a fix for mobs attempting to path over bamboo fences? 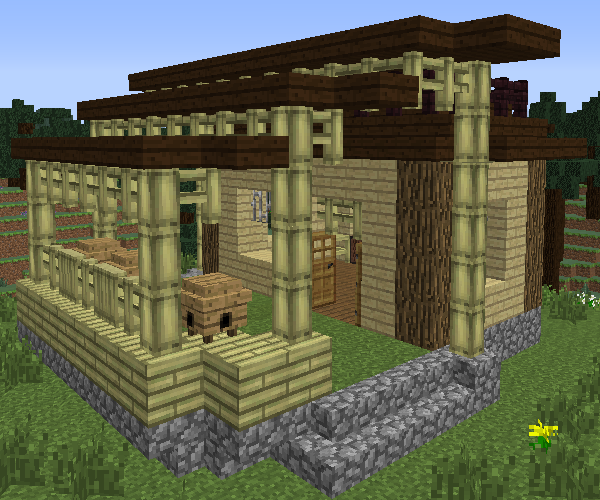 Every world, I try making pastures with bamboo fences, and then hurriedly replace them when I see the animals pressed up against the fence and jumping up and down like somebody tripped with an armload of superballs.